Motorola has won three renowned iF product design awards for their newest additions to their product lines. The MC40 handheld mobile computer, MP6000 multi-plane scanner/scale and TLKR Series radios were recognized out of more than 3,245 entries submitted in this year’s competition. For 60 years, the iF product design award has been an internationally recognized label for award-winning design and the iF brand has become a symbol for outstanding achievements in design. Motorola’s award-winning products will be on display at the iF design exhibition in Hamburg, Germany, opening March 1, 2014. To compete effectively in today’s business environment, you need to be more responsive, more nimble and more efficient. To protect ever-thinner profit margins, you need more data, more accurate intelligence and more streamlined processes in less time using less money. Your supply chain is more global and complex, so you need more real-time, error-free inventory and tracking processes to maintain accountability and productivity. Enterprises from retail to healthcare/pharmaceuticals are turning to automated RFID systems to gather the business-critical asset and tracking data they need to improve processes, productivity, and profitability. As the need grows for faster, more reliable data collection in hectic business environments, so does the demand for higher performance RFID hardware. Motorola is meeting that demand with a new standard in business-class RFID performance – the Motorola FX7500 Fixed RFID Reader. 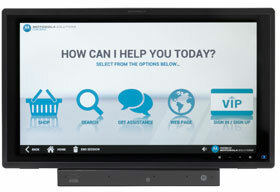 Motorola has introduced its innovative FX7500 series of business-class UHF RFID fixed readers. Built from the ground up, our latest design includes a Motorola-designed RFID radio and Linux based network architecture that offers superior RFID performance with enhanced security, connectivity, and manageability features. The FX7500 reader enables enterprise customers to deploy cost-effective fully automated best-inclass EPC Gen2 RFID solutions. 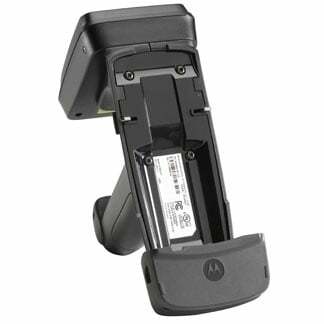 The FX7500 is a symbol of Motorola’s innovative enterprise design, tailored to provide the best in RFID technology that adapts itself to the demands of dynamic application environments. Self-optimizing radio features automatically sense and optimize the reader operation enabling fast, reliable, and efficient reading of tags and delivering superior performance and throughput. The FX7500 RFID reader offers best-in-class read rates, exceptional sensitivity and superior noise rejection for reliable data capture even for the most demanding applications. The Motorola DS4800 Series barcode scanner offers style without compromise by marrying impressive design and innovative technologies with enterprise reliability and functionality. The sophisticated arc design brings a new level of style to your POS, along with comprehensive high-performance data capture. You get first time every time capture of 1D and 2D bar codes, whether they are high density, poorly printed, damaged, under shrinkwrap or displayed on the screen of a shopper’s mobile phone, as well as ID cards, checks and PDF417 bar codes on driver’s licenses for fast and easy completion of loyalty and credit card applications. Motorola announced three enterprise mobile computers running the most popular version of the Android operating system supported by new Extensions by Motorola Solutions security features and the fourth generation of RhoMobile Suite’s cross-platform development framework. First off, Motorola is expanding the industry’s largest portfolio of purpose-built, Android-based devices with the introduction of the ET1, MC40 and MC67 enterprise mobile computers running the Jelly Bean version of the Android OS and fortified with Mx enhancements. The world of RFID can be a mystery for many especially when finding what antenna you should use for a fixed reader. Motorola is one of the leading manufacturers of fixed RFID readers and offers a range of antenna for indoor, outdoor, customer facing, and even industrial applications. This infographic is a great introduction to the Motorola line and will help narrow your choices a bit. For further assistance finding the right Motorola RFID products for your application, contact us at BarcodesInc to speak with one of our RFID specialist.